Sorry for the blatant fundrasier post, but I wanted to let as many people know about a project coming up that is very near and dear to my heart. As some of you know in April 2003 my mother was diagnosed with non-Hodgkins Lymphoma and after going through various chemotherapy and radiation treatments has been in remission for over three years. My mom has been lucky so far, but many are not. Non-Hodgkins Lymphoma is the sixth most common cancer and the sixth most common cause of cancer death, accounting for 4 percent of all cancers and 4 percent of cancer deaths. Because there is no comprehensive national tumor registry in the U.S., the true incidence of NHL may be much higher. Some estimates range as high as 80,000 cases every year. The five year survival rate is 52.6% but the disease invariably returns and is usually fatal. There is hope on the horizon, though. A vaccine called BiovaxID is a personalized lymphoma vaccine that if approved could cure non-Hodgkins Lymphoma for good. So, as I said before there is an upcoming event that I wanted to let you know about. 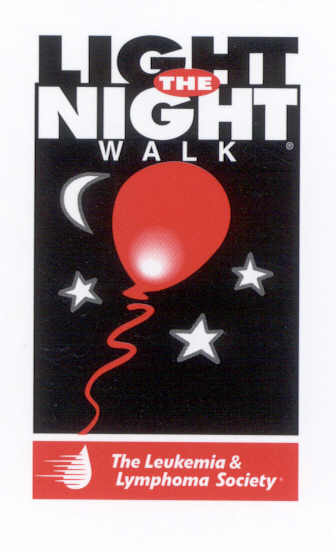 I’m participating in the ‘Light the Night Walk’ taking place in Columbia on October 6th. It’s a fundraiser benefiting The Leukemia and Lymphoma Society. The walk is in the evening, around the lake near the Columbia Mall. If you want to join the team and walk with us, please let me know by Sunday, August 26th. If you are unable to participate but would like to donate to the cause (or get donations from your friends/family/co-workers), please let me know. I will be more than happy to come to you to collect your donation or give you my address to send donations. Every donation helps regardless of the size and 75 cents of every dollar donated goes directly towards supporting the mission. understanding blood cancer & life-saving drugs to fight them. o A newly FDA approved drug, Gleevac, has been shown to normalize blood counts in nearly all patients with chronic myelogenous leukemia (CML). Dr. Brian Druker, a Society-funded researcher, is responsible for this remarkable innovation in cancer research. o In 1974 the 5 year survival rate for children with the most common form of leukemia was just 53%. Today, 86% of children diagnosed will survive. o The 5 year survival rate for Hodgkin’s Lymphoma has nearly doubled from 40% in 1960 to 83% today. o Someone is newly diagnosed with a blood cancer every 5 minutes. Every 10 minutes a child or adult loses the fight. o 823,349 Americans are presently battling leukemia, lymphoma & myeloma. o Leukemia is the leading cause of cancer death for children under the age of 20. Click HERE to donate to my personalized donation page. Every little bit helps and donations are tax deductible. Help me out and maybe I’ll start posting interesting things instead of YouTube videos everyone has seen before. Thanks for listening, y’all. Hopefully I’ll get the time and energy to write a funny story soon. Like about the time last week where I was stuck in traffic on 95 in a HEINOUS accident for over an hour and the person two cars in front of me FELL ASLEEP AT THE WHEEL while waiting for the accident to clear. While it may sound funny now, you can ask Robbie how un-funny I thought it was in the moment.